Every folklore in existence speaks about a mysterious twin that we have in this world. This “twin” is not related to us in any way biologically speaking, but is a by product of the natural flow of nature. Somehow due to some magical witchcraft called biology this counterpart was crafted exactly to look like us. Doppelgangers are generally considered as harbingers of bad luck and ill fate to a person’s life. They are considered evil and if you think hard enough the reason is not very hard to decipher. Would you like someone stealing your identity? No, you would definitely not want anybody taking over your life, sleeping with your wife or playing with your children. Okay! Enough introduction about doppelgangers and the evilness they possess, let's talk about THE doppelganger you all opened this article for. It’s the unrelated twin of the man who thinks climate change is a joke and wants to build a wall, dip it in gold and make Mexico pay for it all. Yeah the great Trump has a doppelganger living in Spain and it’s a SHE. 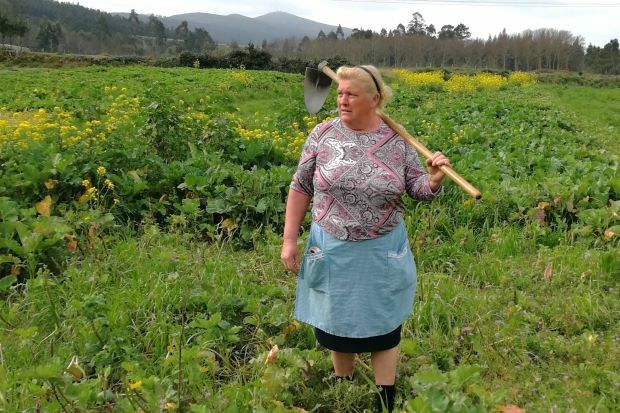 Dolores Leis Antelo or better known nowadays as “Senora Trump”, lives in a small farm in Cabana de Bergantinos with her husband. She lives quite a peaceful life in her farm performing her daily chores and living quite a peaceful of life away from the clutches of technology and the modern world. She doesn't even own a computer or a phone. So you might be thinking where she got all her fame from. This is where Spanish journalist Paula Vazquez comes in. She might be the one who posted the much acclaimed photo but she was not the one who took it. Incidentally it was one of her girlfriend’s who took it. She accompanied Dolores to her farm one day when she was going into the fields to pick up some cabbages and the girlfriend started taking pictures of Dolores on her cell phone. Amused by the pictures Paula posted one of Dolores’s pictures online and it raked up more than 9000 likes instantly making Dolores a sensation across the internet. When questioned about her newfound fame Dolores said she was charmed by the attention she was getting and was heard saying that her fame was due to the colour of her hair. This fame however comes with a price cause when you look like the world’s most infamous dictator you are bound to get hate even when you did nothing from people who are equally jobless. However that’s a minority and the majority of the internet community have supported her and shooed away the retards with a bark louder than their bite allowing Dolores to continue her peaceful life back at her farm.